Join the discussion at the NEM forums! The past year has shown that our ecosystem may be vulnerable by relying on a single entity for success. Strong ecosystems like Bitcoin and Ethereum all consist of multiple purpose driven entities that solve specific problems, and most of them originated from the center of the ecosystem (i.e. Parity, Consensys). 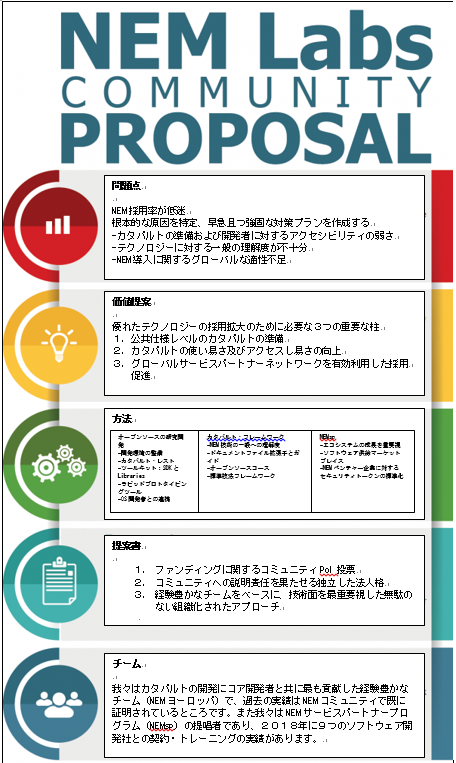 We present to you the proposal and Business Plan for “NEM Labs”, an independent, global, technology-focussed entity with absolute focus on driving mass adoption of NEM technology through accessibility and distribution to grow the NEM developer and entire ecosystem. Our team (NEM Europe) has gained a huge amount of knowledge and experience surrounding all aspects of NEM. Using this experience, we identified the crucial shortcomings with the approach that has resulted in low adoption. More important than knowing the problems is that we have the right solutions. We also want to be clear, we are not here to replace NEM Foundation! We are aware that it may be confusing to the community to see both the NEM Foundation proposal and our NEM Labs proposal at the same time. However, we have no intention to compete with NEM Foundation. If the community decides to approve both proposals we will work with NEM Foundation to prevent both entities are working on the same things. This would probably affect the actual expenses ( and thus extend our runway ) however we believe there is plenty of work to be done on the tech side. We have a specific scope that allows us to have absolute focus on the focus. This focus will ensure our team delivers results in the cost effective and lean way our team has always operated – it is part of our DNA. 1. Get Catapult ready for public launch. 2. Make Catapult easy to use and accessible. 3. Drive adoption through our global service partner network (NEMsp). We hire the right talent to maximize our contributions to Catapult, the Catapult Framework and growth of the NEM ecosystem through NEMsp. We ask the community for $3.27 million. Please take a look at our business plan and post any questions you may have. We will announce further details about the PoI vote in the coming days.